#NotYourAsianSidekick: Can a social movement start on Twitter? We’re going in on Day 5 of #NotYourAsianSidekick, the hash-tag that blew up the Twitterverse with a conversation on Asian American race identity and feminism. And, boy, has it sparked online and offline conversation. Hash-tag founder Suey Park (@suey_park) has joined forces with 18millionrising (@18millionrising) to schedule appearances on several mainstream media outlets talking Asian American feminism — which is remarkable visibility for the Asian American feminist community. Meanwhile, several established Asian American writers have offered their comments in the pages of Time Magazine and the Wall Street Journal. And as of this writing, #NotYourAsianSidekick is still going strong with new tweets being published every few minutes; further, NotYourAsianSidekick.com was launched this week (now with free stickers!). But, of course, the question on everyone‘s mind is: what’s next? 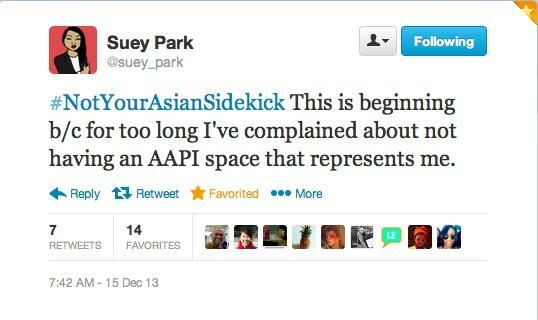 Posted on December 20, 2013 December 20, 2013 8 Comments on #NotYourAsianSidekick: Can a social movement start on Twitter?